Stock status is current as of 4/25/2019 8:15 AMET. The Cables To Go Velocity Mini-Coax F-Type Cable is the right pick to experience maximum video output.� It features an f-type output so that you can easily connect to any cable box, VCR, or TV with a matching f-type input jack. Its slim design makes it perfect to be placed between the carpet and baseboard. The cable comes with a braided shielding to prevent unwanted noise and interference, delivering clear and brilliant picture quality. 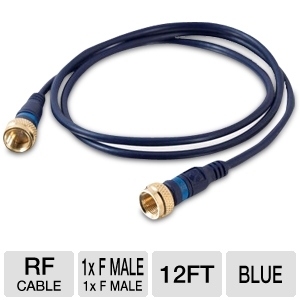 Pick up the Cables To Go Velocity Mini-Coax F-Type Cable today!